Rain or shine. No refunds, exchanges or cancellations. Everyone and all items are subject to search upon entry and at any time inside the venue. Lineup and set times are subject to change. All attendees are subject to BUKU's Purchase Policy. #BUKU2020 takes place on March 20 + 21 in New Orleans. Passes for #BUKU2020 will go on sale in Fall 2019. Join the BUKrewe email list and be the first to know when passes become available! How old do I need to be to attend BUKU? BUKU IS A 17+ EVENT. You must be 17 or older with valid government issued photo ID checked at the gate at the time of your entrance to the festival to enter. NO EXCEPTIONS! TELL ME BUKU’S SAFE SPACE POLICY. BUKU is intended to be a safe space to enjoy music, art, expression and community in complete freedom from any form of hatred or harassment. Our staff are trained to remove individuals violating our zero tolerance harassment policy: NO SEXUAL HARASSMENT, NO ACTS OF AGGRESSION, NO RACISM, NO MISOGYNY, NO HOMOPHOBIA, NO TRANSPHOBIA, NO RELIGIOUS BIGOTRY… or any other form of hatred or discrimination. Acceptance, compassion, encouragement and love is what the BUKREWE stands for. Let’s work together to keep each other feeling safe to party in freedom. WHAT TIME DOES BUKU START AND END? THE FESTIVAL STARTS AT 2PM AND ENDS AT MIDNIGHT. BUKU 2020 box office hours will be posted closer to the event. Upgrades are available as long as the ticket type is not sold out. Tickets for BUKU 2020 will go in sale later this year. All People, bags, and belongings are subject to search upon entry! NO Drones or Remote Controlled toys of any kind. NO Glass of any kind including bottles, jars, pipes. NO Open e-cigarette mods (all vape mods must be empty with a sealed bottle of vape juice). Disposable e-cigs are ok.
NO Video Cameras, Audio-Recording Devices, or Professional Grade Cameras (detachable lenses). NO Tripods or selfie sticks. NO Weapons or anything that can be used as a weapon. NO Poi, Staff, Wands, Whips. Hula Hoops up to 36” wide are OK.
NO Personal protection devices such as mace or tasers. NO Animals (with the exception of service animals and small horses pre-approved by BUKU). NO Bicycles, skateboards, scooters, hoverboards, segways, or personal motorized vehicles unless an ADA approved device. NO Promotional or sample products. NO Paint, Sharpies, or Permanent Markers — Leave that stuff to the graffiti artists! NO culturally insensitive, racist, or discriminatory outfits, headdresses, face paint or accessories. Please contact info@thebukuproject.com with any specific questions. NO Bad Attitudes or Negativity. LOVE your BUKU Neighbor! To keep things safe and speedy upon entry, only clear or small bags will be allowed into the festival. Please review this policy in full and plan ahead. * Guidelines for CamelBak style hydration systems: Although SINGLE POCKET CamelBak­ style water bladder systems are allowed EMPTY into the venue, the water bladders themselves must be capable of being removed from the carrier and must be transparent enough to allow security to visually inspect the empty bladder. Additionally, CamelBak style bladder carriers must have no more than ONE pocket in addition to the compartment that hold the water bladder. Any CamelBak style water bladders that cannot be removed from the carrier and/or is opaque enough to prevent visual inspection will not be allowed into the festival. Any CamelBak­ style bladder carriers larger than the permitted size will not be allowed into the festival. Prohibited items include, but are not limited to: purses larger than a small 4.5” x 6.5” clutch bag, coolers, briefcases, cinch bags, luggage of any kind, computer bags, camera bags, or any other backpack, bag or purse except those made of clear plastic, clear vinyl or clear PVC and not exceeding 13” x 17” x 6”. Am I allowed to bring an empty water bottle or Camelbak? Yes! And we’ll have free water stations on site. Please stay hydrated. You are allowed ONE (1) EMPTY Camelbak that meets our bag policy, Nalgene, Water Bottle, or Klean Kanteen (must be empty upon arrival at the gate). Water will also be sold at bars throughout the site. NO re-entry for GA and GA+ pass holders – once you exit the festival you will NOT be permitted to re-enter. 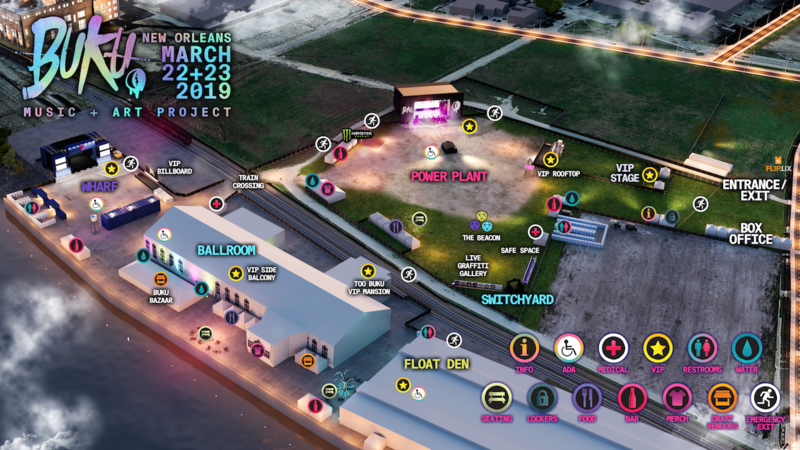 There is unlimited re-entry for VIP, VIP 21+ and TOO BUKU VIP pass holders – you will be required to scan your wristband while exiting the festival and be subject to search upon re-entry. What is your wristband policy? Wristbands MUST be worn for entry into the festival and at all times during the festival (including the times between days). Please do not remove, stretch or tamper with your wristband in any way or you will not be allowed entry. Only wristbands purchased through us or our official partner FlipTix are valid. If you purchased from an unauthorized source and/or the ticket is counterfeit, you will not be allowed entry. Wristbands MUST be worn securely on your wrist and cannot be slipped on and off. All wristband holders must pass through security and are subject to a security inspection. Prohibited items will be confiscated by event staff. Wristbands are NON-TRANSFERABLE, NON-EXCHANGEABLE AND NON-REPLACEABLE except through our exclusive official partner FlipTix. Upon receiving the wristband, it is mandatory that you register it via the instructions listed in your package. Please download the app to register your wristband. I did not receive my wristband order, can I have it reshipped? No, orders will not be re-shipped or shipped twice under any circumstances. If you do not receive your wristbands by the week of the festival, please call Festival Ticketing Purchase Support at 855-427-1943 to have your order reissued to will call. Please note the original purchaser must pick up passes at will call. Lost, stolen, tampered with and/or confiscated wristbands will not be replaced. Be very careful not to lose or forget your wristband. No. BUKU is sold out and will not be selling tickets at the Festival Box Office. A limited amount of lockers are available to rent and available as add-on at the ticketing page. Remaining lockers will be available on first come, first serve basis. Yes, and the BUKrewe wants to ensure that ALL fans can enjoy the show! The festival grounds are ADA accessible. Please contact access@thebukuproject.com with any specific questions. (MSY) Louis Armstrong New Orleans is the closest airport to fly into. Where can I stay when I'm in New Orleans? View all available hotel options HERE. Will there be parking & how much? Yes! There will be parking lots open for BUKU attendees with limited spots available on a first-come, first-served basis. These lots are the property and sole responsibility of, and will be controlled and staffed by, the New Orleans Convention Center. BUKU is not responsible for anything that goes on out there. You MUST be 21+ to drink. There will be a maximum limit of two (2) drinks per person per order. Good news — VIP 21+ ticket holders may leave the VIP-designated areas with a drink, but only one (1) drink at a time. Please drink responsibly. Do not drink and drive. Do not buy a drink for anyone under 21. You will not be served if you are under 21, don’t have a photo ID proving you are at least 21, and/or are intoxicated. Will there be food at BUKU? Hells yeah! We work hard to make sure the food sold at BUKU caters to everyones needs while also offering dank New Orleans food. Come hungry and check back soon for more info on vendors and food options! ROLLING GA IS EPIC ENOUGH OR GET CLOSER TO THE ACTION WITH GA PLUS ACCESS. BUKU BOASTS ONE OF THE MOST UNIQUE VIP EXPERIENCES AROUND WITH THREE DOPE OPTIONS AT SCALED PRICING AND PERKS. For any and all ticketing related questions, issues and support, please contact 855-427-1943 or support@festivalticketing.com. Join our FanStaff BUKrewe! This special program is designed for fans that want to get involved and offset the cost of an attendance ticket. Learn more about the program and apply HERE. Interested in becoming a sponsor for the festival? Get in touch with us at sponsorship@thebukuproject.com. Interested in becoming a food vendor at #BUKU2020? Click HERE to apply now. For publicity/press inquiries, please email media@thebukuproject.com. For ADA patrons who need special assistance, please email access@thebukuproject.com. For more ADA info click HERE. Have a question not answered here or want to chat with the BUKrewe? Send us an email to info@thebukuproject.com.